This late stage Folsom preform was discovered in the Lake Ilo National Wildlife Refuge sometime between 1991 and 1992. It was found on the lakebed by the Lake Ilo Archaeological Project team after the water was lowered in 1989 to allow replacement of the aging dam. This Folsom preform was broken during manufacture but it still retains its original striking platform. The Folsom knapper who made it used fine and delicate pressure flaking to shape it. Very prominent parallel pressure flaking was also applied along both edges of the side that was to be fluted, creating the "hollow-ground" effect that is seen on some Dalton points. This heavily patinated Folsom point is made of Knife River flint and it measures 1 1/8 inches (3 cm) long. The Lake Ilo Archaeological Project site is located in western North Dakota near the town of Dunn Center. The project studied thirty-seven site locations on 600 acres of exposed land. More than 58,000 stone artifacts were collected. Large scatters of stone tools, waste flakes, hearth stones, pottery shards, and a stone tipi ring, lay on the old lake bed's surface. Two site localities, that were excavated, were dated to about 10,500 years before present. 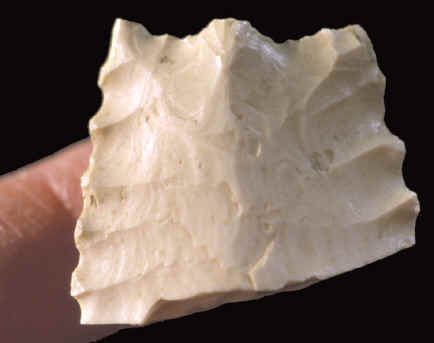 The Lake Ilo Archaeological Project produced many Folsom related artifacts, such as projectile points, scrapers, cutting tools and preforms. This picture shows a magnified view of the striking platform on this Folsom preform from the Lake Ilo site.